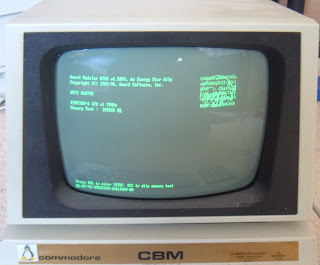 This is the first in a series of articles covering a project involving a Commodore Pet. This Pet has quite a life story, this first part covers how I got it and what I did with it 10-12 years ago. The next articles will cover recent developments. Here it is, as it was in 2009 (ignore what's on the screen, more on that later). The unit started life in the late 1970's as a 4032-32N. So 40 column display, 32K memory. 1MHz 6502 Processor. 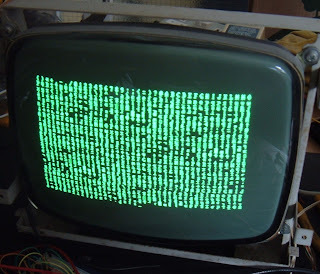 This one has a 12" green screen monochrome CRT monitor. 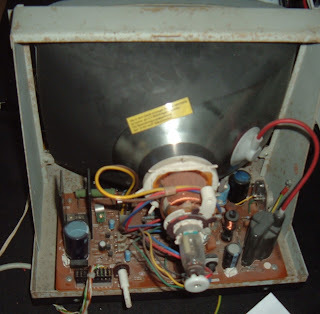 Earlier models had 9" displays, certainly the 40 column versions. 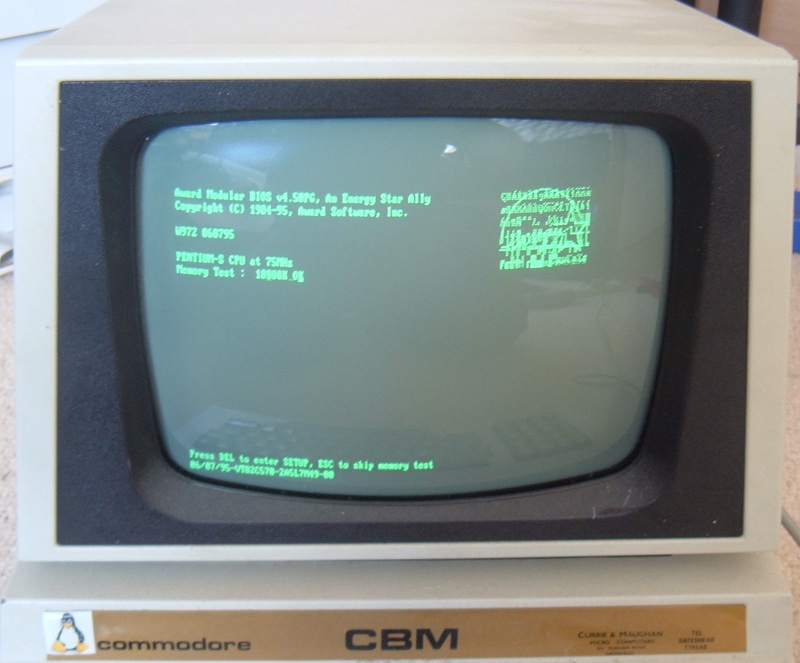 I think the 80 column version (8032) always had 12" monitors. I'm calling it a PET (Personal Electronic Transactor), but I think that only refers to the original 2001 with the chiclet keyboard and built in tape player. 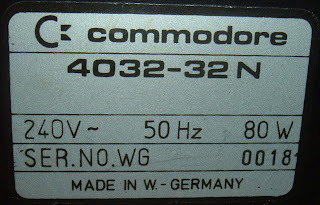 The label on the back just says 4032-32N. The label on the front says CBM, but I have always and will probably continue to refer to it as a PET or Pet. 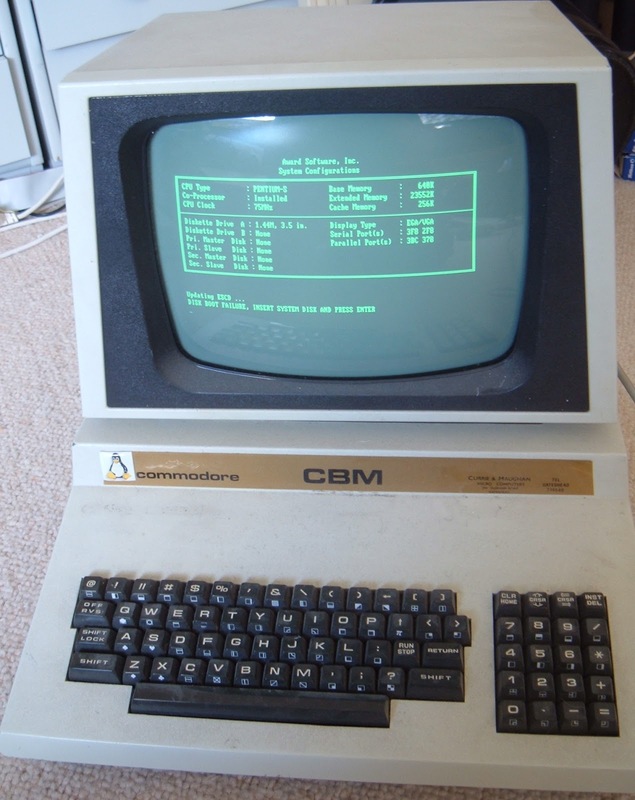 It's probably more correctly a CBM - Commodore Business Machine(S), but I think I'll stick with PET. The black name place has been replaced with a custom one from the original suppliers (Currie and Maughan of Gateshead), but unfortunately this has become damaged (the Tux badge is hiding where it is damaged). There is still a Maughan Microcomputers in the Metro Centre, I wonder if they are related? The normal 4032 has a black label. 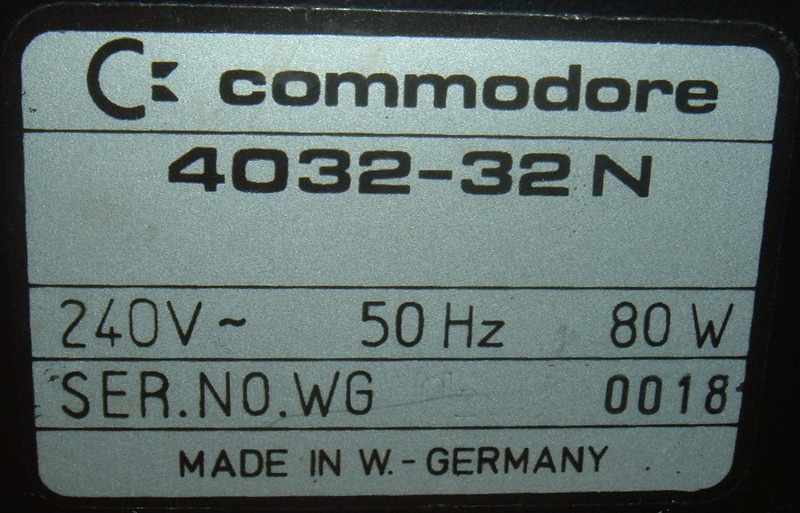 I may print a normal black CBM 4032 label and stick it over. Anyway, at some point in the 90's, it died. I'm told the screen filled up with random characters - a common fault in Pets (the screen below is a 'reconstruction' of this sort of problem). The owner at the time attributed this to the power supply and 'fixed' it by removing the massive transformer and fitting some sort of switch mode supply. Not sure how well that worked (if at all), because he then removed the main board and power supply with the intention of installing a PC motherboard, but didn't get much further. So at this point (the late 1990s), I got the Pet, with the keyboard and monitor intact, but without any of the internals. I tried to source a Pet motherboard at the time, but failed. I wanted to keep it, but an empty shell wasn't much use, so decided to continue down the route planned and installed a PC motherboard. 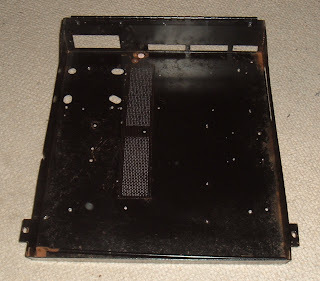 There was plenty of space for a full size AT motherboard - no, I didn't forget the X, this wasn't ATX, but the older AT standard, before the standard rectangular cutout with all the connectors on. No USB, no onboard sound or video, not even a mouse port! However, it was a functional PC, but there were two main problems to solve, the display and the keyboard. Firstly, the display. The Pet display is a 12" green screen monitor with separate horizontal sync, vertical sync and video input. These are all at 5V logic levels. 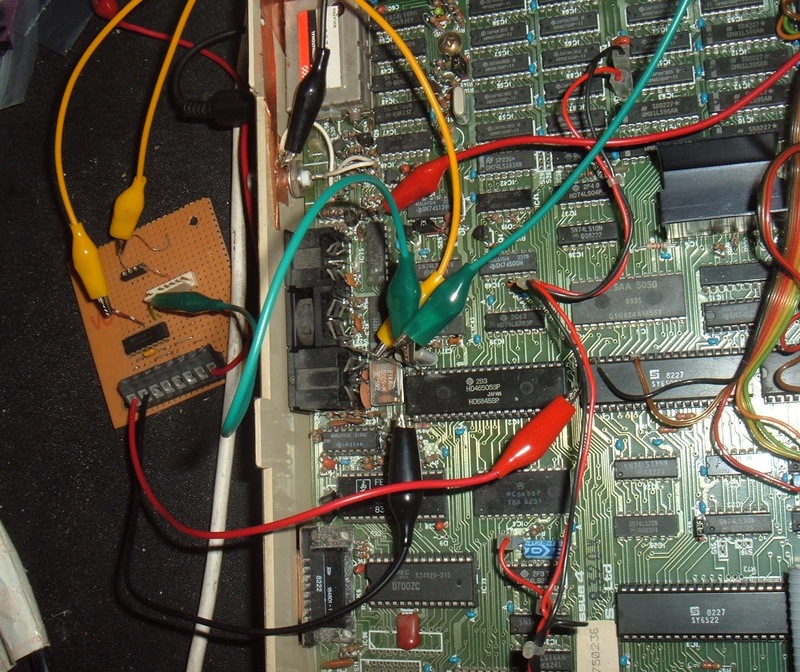 I'm not sure how I managed as I didn't have a scope at the time, but I found a PC video card capable of driving a monitor at a suitable resolution (it was the old Hercules spec) and built a little board to invert one or both of the sync signals to drive the display. 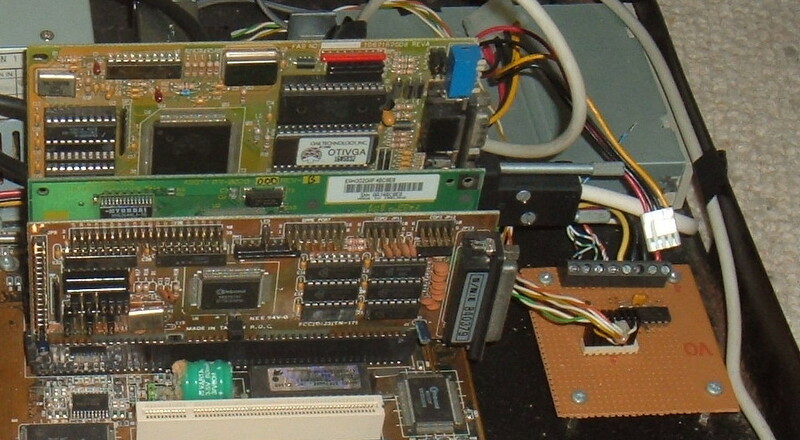 The video card is the one at the back, and the board on the right has the 74LS86 that inverts and buffers the sync signals. That actually worked quite well, apart from the 'enegry star' logo on the top right, it sort of works, but was sufficient for the purpose. Next, the keyboard. 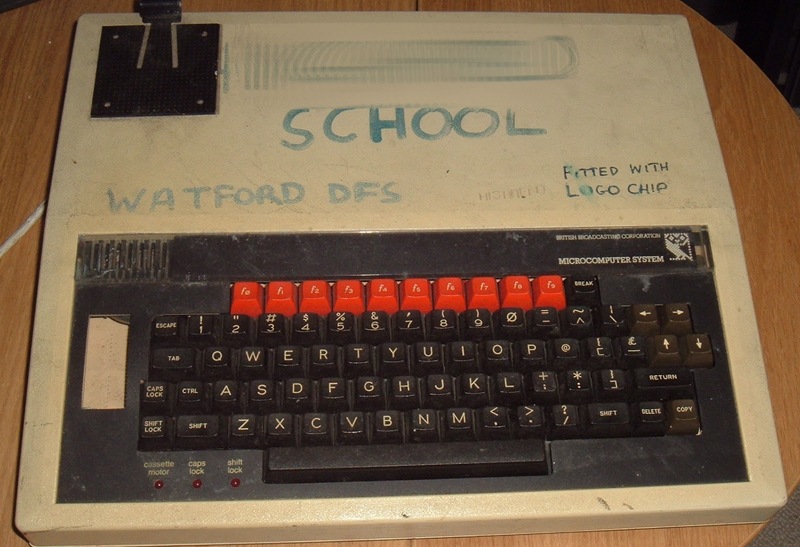 The PET has an 8x10 keyboard matrix, and the chosen motherboard had the old 5 pin DIN keyboard connector (AT style). 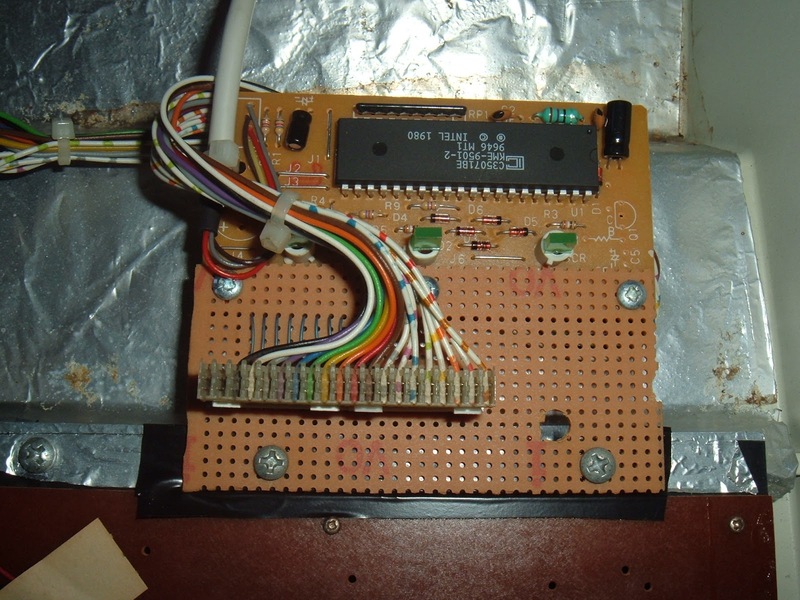 I adapted an old PC keyboard to drive this matrix, with an adapter board to interface between the 20 pin Pet keyboard and the PC Keyboard controller board. 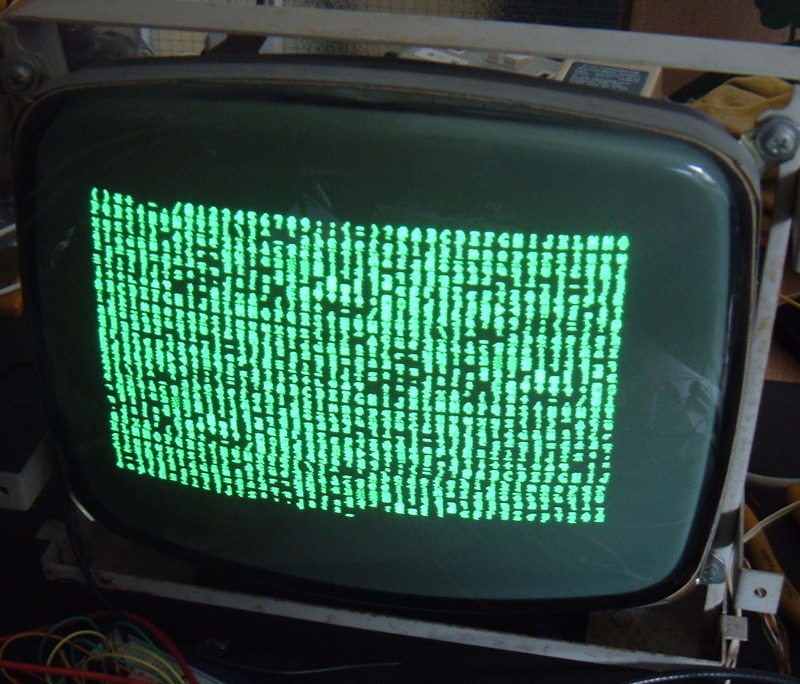 It was a partial success, as the matrix was different, so I needed to remap them in software at the PC side. 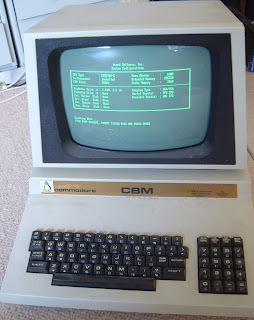 Some weren't mapped by the controller at the keyboard end, so weren't sent through, but most of the keys worked. 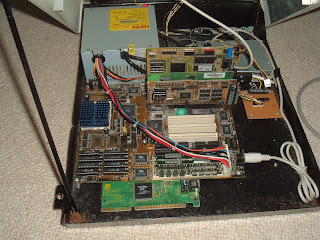 I fitted what would have been about a 5 year old motherboard at the time, a Pentium 120, with 32MB RAM, two network cards and a floppy drive. As it wasn't doing much, it ran fanless, underclocked to 75MHz. Note the wonderful original car bonet style prop for holding the case open! The task it had was running some software called 'FreeSCO', (Free Cisco). This was a tiny linux distribution which booted from a floppy disk and basically does what you average home router does these days. It took the network from my cable modem on one network card and made this available to a number of PCs plugged into the other network. At the time, you could only have one PC plugged in at a time and needed to reset the router to change to a different PC. If I remember correctly, I had 128kbit broadband at the time, so this was more that capable. 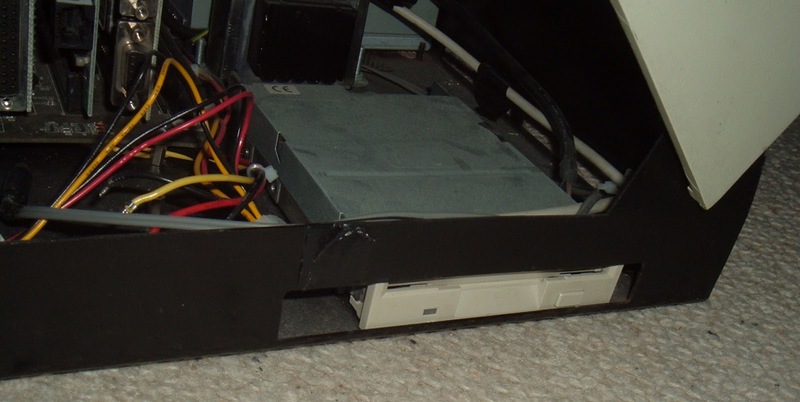 The floppy drive was accessible via a slot on the side intended for access to memory upgrades. I added a switch to turn off the screen most of the time and there it sat as a router for many years. It was only when I moved back into the centre of Tynemouth in 2004 that I got ADSL broadband and replaced the Pet encased router with a considerably smaller Netgear DG834. The Pet then sat patiently waiting a new task. I had tried on a number of occasions to give it a new purpose in life, but the monitor was always the problem. The only thing I had that would drive it was an ISA video card, and any modern PC I put in there wouldn't support it. I looked around for quite a while for a 12" colour monitor that I could fit in the top casing, but couldn't find one. I did spend quite a while trying to get it running from a BBC Micro motherboard, I got a model B with a tatty marked case and thought it would be a good match, The BBC and the Pet use the same 6845 video controller, so I presumed it would drive it fine, however I just couldn't get it to sync up. I now know this is due to the standard video signal that the BBC outputs not being in the tight range the Pet monitor accepts. I also realised how lucky I'd been with the PC video card. 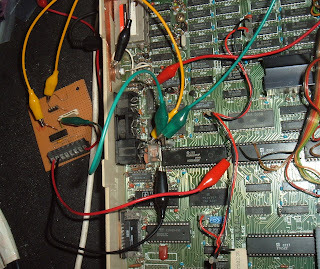 The CMOS battery had gone bad on the motherboard, so I removed the whole thing as I couldn't see it being used again. The Pet was once more empty. So there it sat, waiting for a PET motherboard or a new purpose in life. Read about it's exciting revival in next week's thrilling instalment of The Pet Project!